This year, Peninsula Spring Moon Mooncake is available in our fruits hampers! Peninsula Spring Moon Mooncake is the most delicious and precious mooncake in the market. 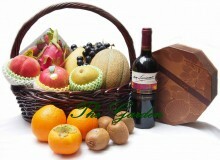 It is the most precious mooncake with fruits hamper for your valueable customers or partners! Click the button below to add the Mid-Autumn Fruits Hamper - 8 types seasonal fruits + 1 box Peninsula Spring Moon Mooncake + 1 bottle Red Wine P001 to your wish list.